Previous work that I’ve published about the geography of contributions to Wikipedia showed the varying types of local engagement that different regions have, the primary reason that Sub-Saharan Africa, in particular, has such a low proportion of locally created content, and some of the ways that Sub-Saharan Africa’s already extremely low proportion of local contributions is inflated by just a few outliers (meaning that the vast majority of content written about countries in Sub-Saharan Africa is created from outside the region). In all of that work, we employed a simplified distinction of ‘within region’ or 'outside region’ when considering the geography of edits. However, it is possible to also look at which regions send edits to which other regions. Thus, instead of a univariate map or a bivariate scatter plot, we can represent the data as a network of flows. The network above is just such an attempt. In it, edge (a line connecting nodes) thickness is proportionate to the total number of edits received. That is, if a region receives most of its edits from North America then the edge from North America to that region will be thick. 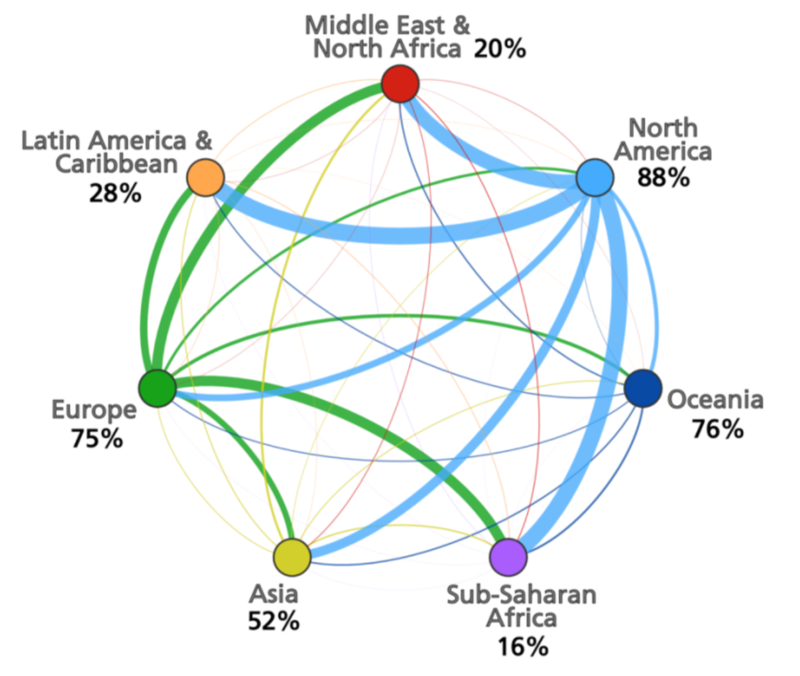 When looking at flows of geographic information, there are “net-importing” regions (Asia, Latin America & Caribbean, Middle East & North Africa, and Sub-Saharan Africa) and “net-exporting” regions (North America, Oceania) in terms of edits. Sub-Saharan Africa receives 10.7 more edits from outside than it commits to the outside. North America, in contrast has a figure of 0.38. The next post will look at the data somewhat differently. Instead of where edits are received from, it will focus on where edits are sent to (as we shall see, this is an important difference). On Sunday, I use an extended stopover in San Francisco airport to pop into the Wikimedia Headquarters and chat about uneven geographies of voice and representation on the platform. In looking through some of the previous work that Ralph Straumann, Bernie Hogan, Ahmed Medhat, and I did on the topic, I noticed a few results that we haven’t yet had a chance to blog. The graph above shows us something very interesting about the locality of participation and voice on Wikipedia. It investigates the topic by looking at the proportion of within-region-edits to Wikipedia articles. On the vertical axis of the figure we can see a clear division between regions that are largely able to define themselves and regions that are largely defined by others. The world regions separate into two distinct groups of three (with Asia in the middle): Sub-Saharan Africa, Middle East & North Africa, Latin America & Caribbean receive comparatively few edits from within their territories (around 25 percent). Europe, Oceania and North America on the other hand receive primarily edits from within (around 75 percent). Asia is edited from within and from outside to almost equal degrees. In other words, there are significant parts of the world in which a majority of content is not locally generated. 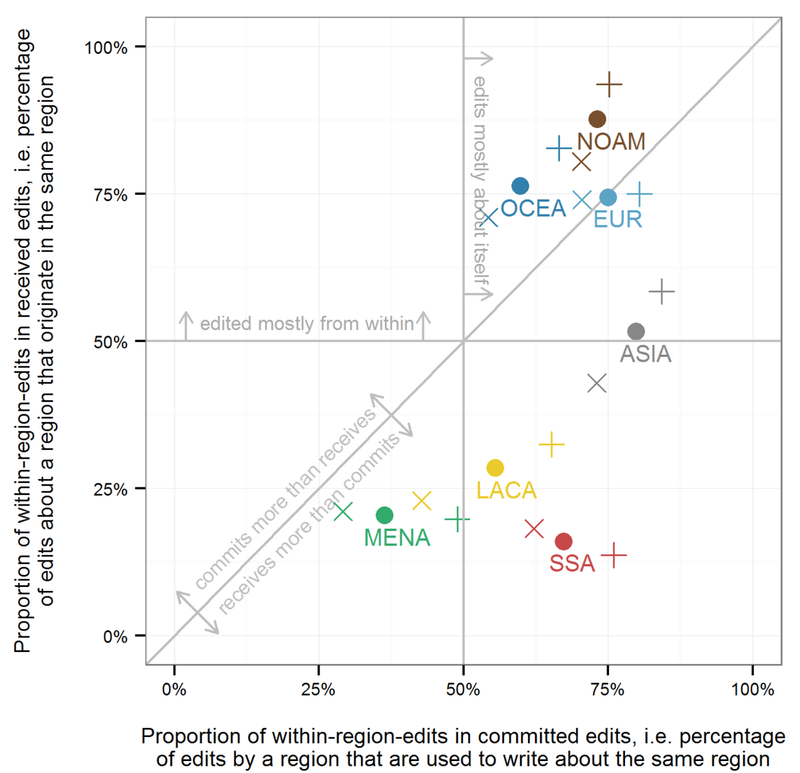 Asia, Europe and North America all have 73–80 percent of their committed edits staying within their own region. Interestingly, Sub-Saharan Africa commits just slightly less within-region edits at 67 percent. Oceania, Latin America & Caribbean and especially Middle East & North Africa fall behind with 36–60 percent. In other words, not only does the Middle East & North Africa have a lot of non-locally generated content written about it, many of the edits coming from the region are used to write about other parts of the world. • Even when editors from Sub-Saharan Africa spend most of their edits within region, their small numbers mean that most content still comes from elsewhere. • The global cores of North America and Europe self-represent very effectively by focusing on their own regions. • Content appears to be very sensitive to feedback loops. A lot of content on an area in one language leads to more content in other languages as translations rather than similar local content. The global cores focus their editing primarily within their own territories. Large amounts of geospatial content show no sign of deterring people from further contributions and editing: as more content exists, so too do more articles to amend, augment, update and build upon. It is possible that a stock of good content may be an attractive “editing ground” for Wikipedians, whereas a scarcity of content, beneath a certain unknown threshold, may – somewhat paradoxically – demotivate people to fill in the blanks. A relative lack of content may further reinforce perceptions amongst editors that little content equates to a small audience that is not worth writing for. And they will also be forthcoming in a new paper (that we’re currently working on) that focuses specifically on these issues of self-representation.